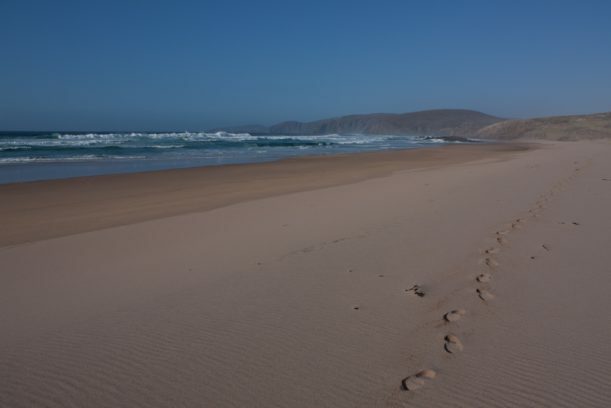 As you round the headland that juts imperiously over the broad ochre strand of Sandwood Bay, you'll catch a first glimpse of the Cape Wrath lighthouse peeking over the low, dun hills of the horizon, beckoning you the final few miles towards the end of one of the world's finest long distance walks. You'll already have crossed most of the north west coast of Scotland via Morar, Knoydart, Torridon and Assynt, winding through its most beautiful glens, lochs and mountains. Cape Wrath itself, staring out into the white capped North Atlantic, closer to the Arctic Circle than London, is now within a day's walk. The Cape Wrath Trail is not an officially recognised UK National Trail. In truth, it is not really a trail at all, more a jigsaw of routes between Fort William and the most north westerly point of the UK to be assembled according to your own preferences. Perhaps because of this unique flexibility and lack of formal status, it has become highly regarded by many backpackers. It's a tough test for anyone and you'll brave genuine wilderness, rugged terrain, rain, wind, midges, bog and remote river crossings. Most people take between two and three weeks to complete the full journey and whatever time of year you attempt the trail, it will test the limits of your physical and mental endurance. But dark, boggy moments are quickly forgotten amidst a solitude and beauty rarely found in modern life. This trail has an intriguing capacity to draw people out of their everyday bustle into some of the most wild and remote places Scotland has to offer. The cape itself, so aptly named, pulls you inexorably northwards - there can be few other long distance paths with such an inspiring finale. There is also something in the challenge of traversing such a vast, primal and largely unspoilt tract of land that explains why this route has attracted so many fans. Its beauty lies in its freedom - you'll find few signposts around here, this one's for true wilderness connoisseurs, and it's down to you. The new guide book draws together, updates and attempts to improve on a variety of routes that have previously been suggested. It will also offer a wide range of variations, recognising that there can be no definitive path suitable for all. It shares the same intrinsic aims as those that have gone before, namely to visit the most scenic areas and avoid most tarmac roads and high level mountain traverses. This brings the route well within the abilities of all ambitious, competent hill walkers. The trail traditionally begins in Fort William and winds across Argdour towards Glenfinnan taking in the gloriously remote rough bounds of Knoydart, before striking north to Shiel Bridge, Strathcarron, Kinlochewe and lnverlael, near Ullapool. A popular alternative route briefly heads up the Great Glen Way to Loch Lochy before turning north to cut across Glen Garry and Glen Shiel before rejoining the main route at Morvich. North of the Ullapool road, the main route turns inland to Oykel Bridge before heading towards Glencoul via the majestic Ben More. Then, below the shadows of Arkle and Foinaven, the final stretch passes Rhiconich and on to the farthest west coast and over the moors to Sandwood Bay and the Cape Wrath lighthouse, the end of the journey. Follow as much or as little of the route as you like. Take detours, plan alternatives, make the journey to the cape your own. It's one that will live with you for the rest of your life. The guide will be split into three main sections: Fort William to Strathcarron, Strathcarron to Inverlael (Ullapool) and Inverlael to Cape Wrath. Because of its remoteness, this is not a path that lends itself particularly well to being walked in sections, but all of the points above allow reasonable access by bus or train if you want to pick up or leave the trail. The guide is written south to north ie Fort William to Cape Wrath, but the walk is equally rewarding walked in the opposite direction, perhaps lacking such an impressive finale. The sections themselves are sub divided into a series of legs. These legs are not intended to exactly correspond with single days of walking although in many cases they do. Varying age, ability and terrain make it difficult and potentially dangerous to suggest generic mountain days to rigidly follow. Some legs can be walked comfortably in a day, others may be possible in a day but require a long, hard slog and some may require two or even three days. The aim of this guide is to allow you to create your own personal itinerary, based on your pace, needs and ability. The main route steers near what few hotels, hostels or bothies there are in this part of the world where it is practical and not too circuitous to do so. Although it is possible to walk the trail without a tent, you'll find it severely limits your options and from a mountain safety point of view, carrying some sort of shelter on the remoter sections is definitely advisable if not essential.To help you plan your route, each leg notes accommodation and wild camping options as well as any amenities and transport options available. The main route alternatives are listed in each leg. These cover some of the established detours to the main route. These range from shorter options or easier terrain to more technical routes for those seeking an even greater challenge or allergic to civilisation. There will be those that regard any attempt to codify this route as something approaching sacrilege, but hopefully the guide will strike the right balance between providing useful and necessary information to support the planning of a trip without an overly prescriptive approach. Make it what you will and go where the glens and weather take you.